The holidays are in full swing at the Disneyland Resort! From ride overlays to enormous Christmas trees, we've checked it all out and are ready to report back to you! Haunted Mansion Holiday has been up since Halloween, but now it's joined by It's A Small World Holiday and The Jingle Cruise. 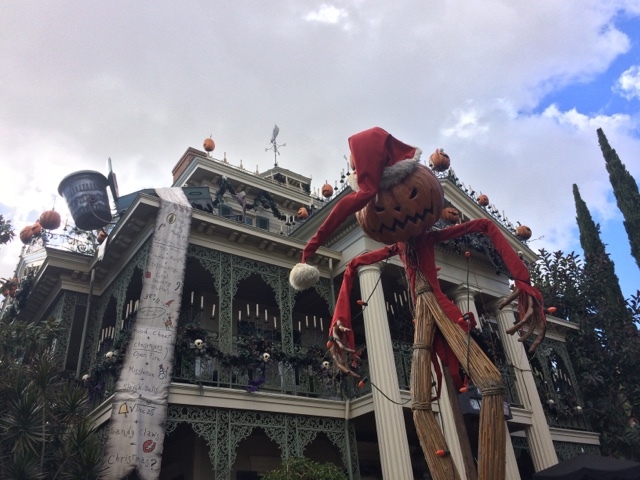 Haunted Mansion Holiday is my absolute favorite with its absurd attention to detail. Check out the long list running down the front of the mansion with Jack's "Christmas Formula." Total perfection! 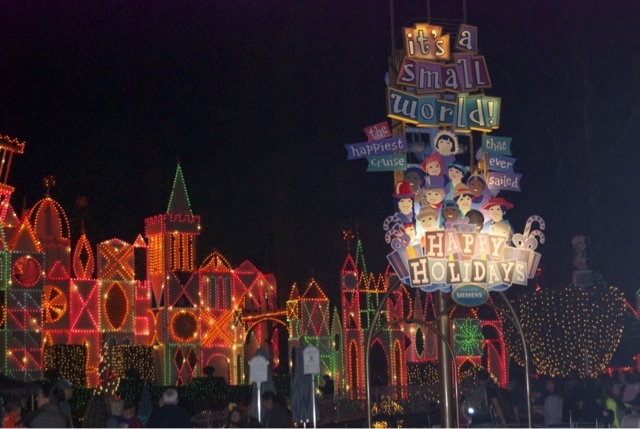 It's A Small World Holiday it quite a sight to see! If you love Christmas, this is for you. If you get overwhelmed easily...you might want to take a pass. But it's beautiful from the outside! 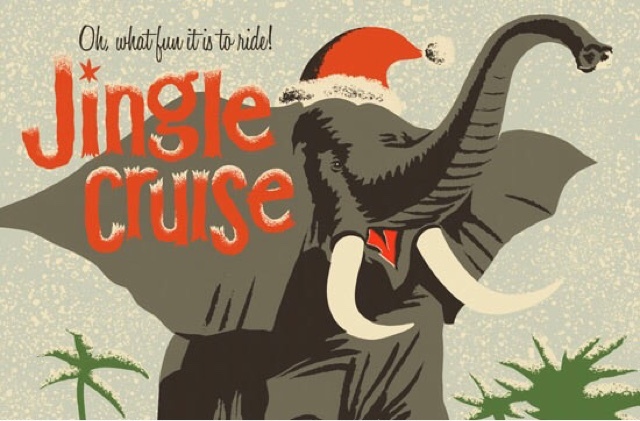 I missed the Jingle Cruise by a couple days this year, but I've been on it before and it's adorable! The jungle is covered in decorations and the skippers have seasonal corny jokes. What could be better? 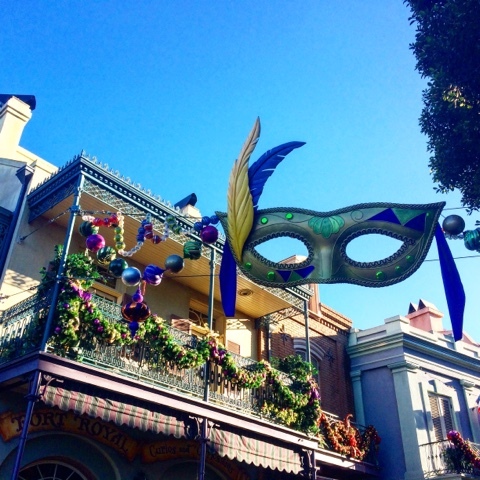 Just around the corner from the Nightmare Before Christmas scene at the Haubted Mansion is this beautiful Mardi Gras inspired decor in New Orleans Square. 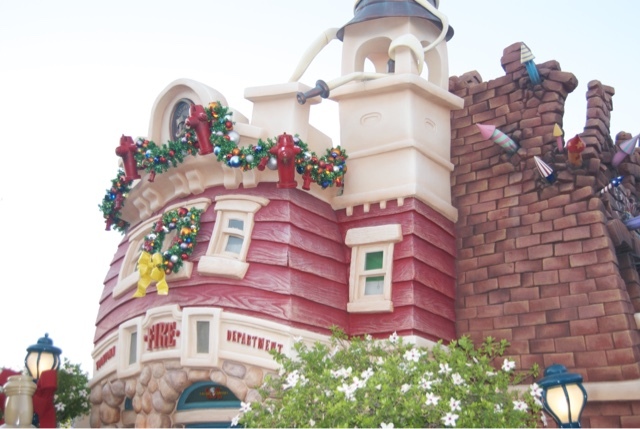 Toontown was really beautifully done this year with garlands, bows, and lights on every building! 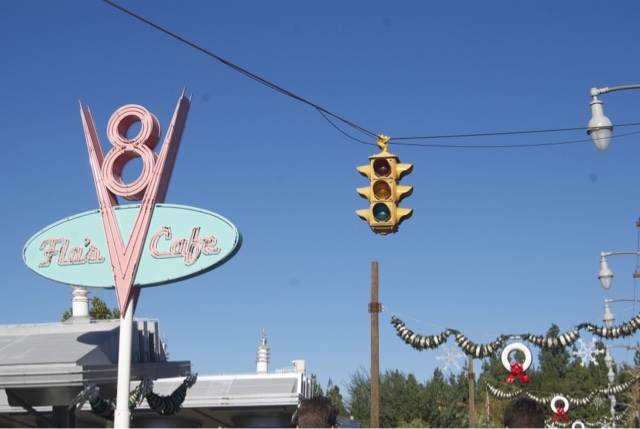 Cars Land has some of the best themed decorations around! Garlands made from filters and tires hang across Route 66 and each little area has additional decorations. There's a decorated tree made of orange cones at the Cozy Cone and there is a shiny silver tree decorated in old records at Flo's. 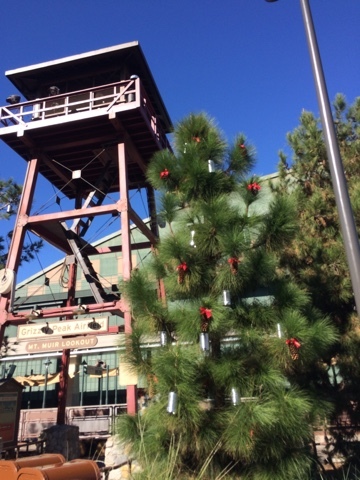 Grizzly Peak has different decorations all over, all in a very natural, rustic style with lots of pine cones and bows. It's beautiful and understated. I loved it all! Main Street doesn't have the usual decoration setup that it's had for the past few years. 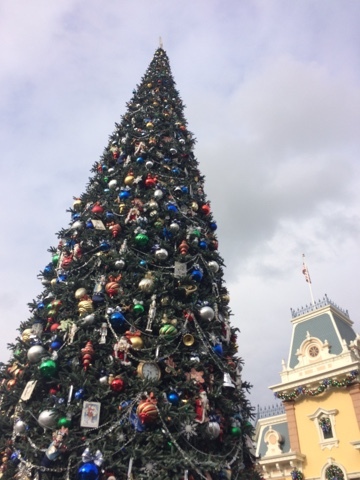 The epically tall Christmas tree is still sitting at the Town Square end of Main Street and is as impressive as ever. However, the garlands that usually go across Main Street are missing this year (rumor has it they're too low for the tall Pain The Night Parade floats to pass under). 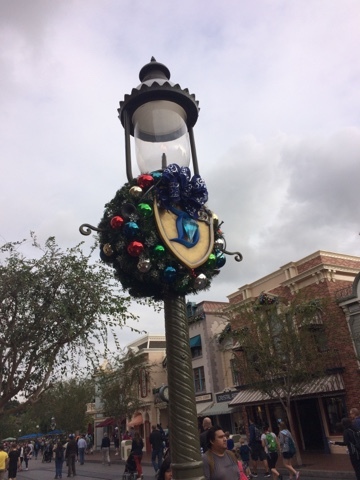 Decorated wreaths have been placed around the "diamond Ds" that go along Main Street. The Castle is still in all of its Diamond Celebration glory! No winter castle this year, which is a bummer, but I love the diamond decorations so much that I don't mind missing it this year! Plus, they added a pretty cool ornament garland/wreath just so you know they didn't completely ignore the traditions of this time of year. What do you think of this year's decorations what would you life to see them do next year? Let us know your thoughts in the comments below! Disneyland is one of my favorite fun place where I want to go again and again with my family. 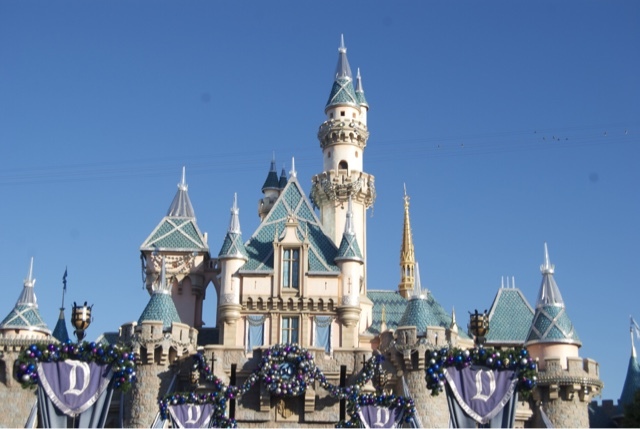 The update provided by Disneyland resort is so helpful for all those who are thinking to visit Disneyland anytime soon! Disneyland is really very good place. if tourist go at once they want to go again and again with their families and friends. Disneyland Paris Holidays is best place for tourist. Disneyland is always great place for tourist. thanks for blogging about it.